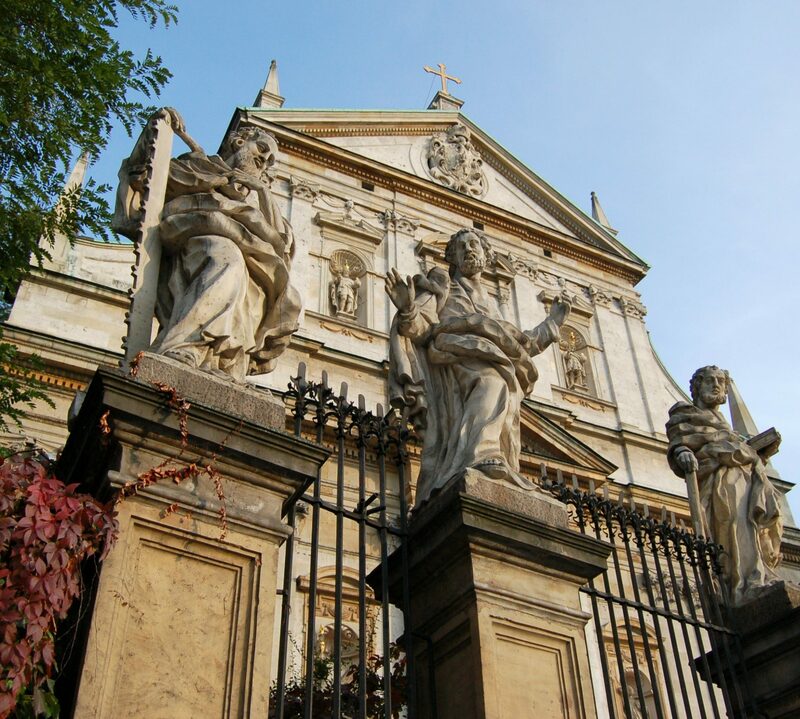 Church of Saints Peter and Paul is located at Grodzka Street, between the Krakow Main Square with the Wawel Royal Castle. It was the first structure in Krakow entirely Baroque in style. It was built between 1597 and 1619 under the careful eye of premier Italian architects. Just as most of the Baroque churches, it closely resembles Il Gesù in Rome. The facade of the building is arguably the most magnificent of all Baroque churches. The Church of Saints Peter and Paul was founded for the Jesuit order. 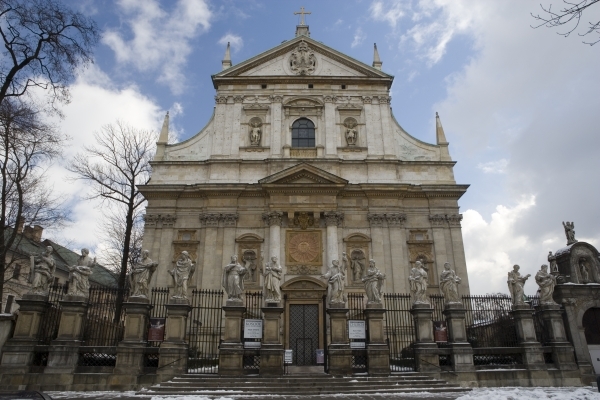 The Jesuits arrived in Krakow in 1579 and did not receive their own church at first. Because the Jesuits’ plans assumed erecting a grand temple, it was not so easy to find a place and a founder. Ultimately, King Sigismund III Vasa became a patron of the undertaking. In 1596, the Jesuits started to buy squares and houses at the site of the planned construction, all at the expense of the king. The magnitude of The Church of Saints Peter and Paul contrasts with the austerity of the neighbouring, old Romanesque St. Andrew’s Church. The church was modeled, both in the plan of the spatial layout and design of the facade, on Il Gesù in Rome. The first project of the building was made by an Italian Jesuit, working in Poland for twenty years, Giuseppe Britius. After him, Giovanni Maria Bernardoni took over and changed the original project a little. He customised the appearance of the temple to the preferences of the inhabitants of Krakow. As a result, raise the walls were raised to slender the interior. After his death, construction was finished under the eye of the royal architect, Giovanni Trevano. A great, Baroque facade from the early 17th century was constructed with dolomite. It was designed to fit the patterns established by the first Baroque church, Il Gesù in Rome. In the lower part are the statues of four Jesuits’ saints, Ignatius of Loyola, Francis Xavier, Aloysius Gonzaga, and Stanislaw Kostka. Above the portal, there is a large emblem of the Jesuit order. On its both sides there figures of yet another saints, Sigismund of Burgundy and Ladislaus I of Hungary. The very top of the facade is adorned with the coat of arms of the Vasa dynasty since king Sigismund III Vasa was the founder of the church. The most characteristic element of the church’s architecture is a fence with twelve enormous plinths, on which large statues of apostles were placed. They were originally made in 1722, but due to acid rains occurring in this region that destroy stone statues, they were replaced with contemporary copies. Church of Saints Peter and Paul owns the longest Foucault pendulum in Poland (46,5 m). Every Thursday, demonstrations of the apparatus take place that allows observing the proof of the Earth’s movement.